Hull-O Farms welcomes each and every guest with a genuine desire create lasting memories and wonderful family experiences. Our Family Farm-stay Vacations are truly remarkable. Generations connect here; parents, children, grandparents and siblings step back to a time when most Americans made their living from nature, more people lived on farms than in cities, and life moved according to the rhythms of the natural world. 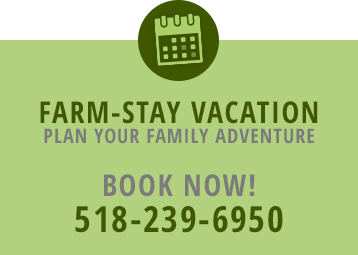 From private accommodations in our Farm Guest Houses, to great get-togethers for campfires and hayrides, each member of your family can join-in the day-to-day activities of a real working farm, or just sit-back, relax, and enjoy the beauty of the Great Northern Catskill Mountains.